The game will begin at 6pm AEST and you can follow it live with The Roar below. They were favourites going into their previous game against Pakistan but Australia’s worst fears came true on a cold Harare day. A below-par effort with the ball led Pakistan to 194 batting first but even that wouldn’t have prepared the fans for what followed with the bat. Aaron Finch, with a bagful of runs under his belt, failed to get going for once and the rest of the batting side finished up with a very ordinary effort with the bat. 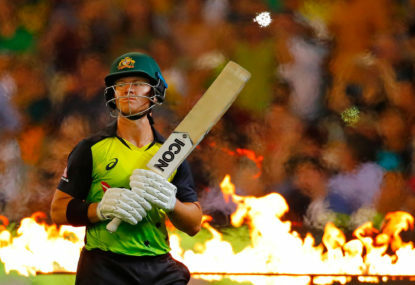 The foundation of that underwhelming showing was laid by D’Arcy Short whose 34-ball 28 was one of the many such knocks he has played in T20 cricket since the start of the IPL and once the required-rate had mounted to over 11 an over, the remaining Aussies kept fighting a battle in vain. Sure, Pakistan bowled the channels needed of them, and more vitally their lengths were way better than the Aussie seamers but coach Justin Langer’s bigger worry will be their batting. Short’s struggles have been well-chronicled, to the point that he could be on the verge of being dropped. Among the batsmen in this series who have scored at least 25 runs, Short is the only batsman with a strike-rate of less than 100 – quite shocking for a batsman, who before the IPL struck at more than 150. Glenn Maxwell hasn’t set the world on fire either in the limited opportunities he’s got and the IPL form worries will continue to remain. The good news for Finch and company is that Alex Carey showed some signs of form in that defeat to Pakistan and could be an option for the management at the top of the order. Zimbabwe also exhibited glimpses of some batting form against Pakistan, something that was missing from their first two games thanks to Solomon Mire’s 94. It turned out to be Zimbabwe’s highest individual score in this format and while it didn’t quite convert into a win for the side there should be some confidence going into this encounter. Australia to crush Zimbabwe before facing off against Pakistan in the final. Be sure to join The Roar for live coverage of this T20I in Harare from 6pm (AEST) and don’t forget to drop a comment in the section below.